Clayton Van Wert was throwing out trash at a dump site on the edge of the Red Lake Indian Reservation in Minnesota last month when he heard whimpering and banging coming from a burning dumpster nearby. "I looked in and I could see this figure of a dog that was coming through the flames," said Van Wert. He reached into the flames and pulled the still kicking puppy, a 5-month-old husky mix, out of the ashes. "All of his fur that was stuck to his body resembled a very burned marshmallow," Van Wert recalled. Van Wert called a conservation officer, who brought the puppy to Red Lake Rosie's Rescue, a dedicated local animal welfare organization. Folks associated with the rescue took the puppy to a local clinic, which tended to his burn wounds, performed skin graft surgery, and set him on the road to recovery. They named him Phoenix, and what a will to live he exhibited despite the horror that some miscreant inflicted on him. As soon as we heard about Phoenix's story, we wanted to pitch in. We routinely offer $2,500 rewards for information leading to the arrest and conviction of animal abusers, and in this case one of our compassionate board members doubled the reward to $5,000. But we also wanted to assist Red Lake Rosie's Rescue with the extensive medical costs for Phoenix. That's where the HSUS Sparrow Fund comes in. My wife Lisa and I started the Fund two years ago after we noticed injured wild and stray animals in need of veterinary care when we traveled across the country. The Sparrow Fund exists as a lifeline to animals in the gravest need – rapidly providing funds to aid critically wounded wildlife and homeless pets. We named the Fund after a passage in the Bible, Matthew 10:29, that tells us that not a sparrow falls without his Maker knowing. The Sparrow Fund is devoted to that ideal-that every animal's life matters. Jacob was struck four times with a very sharp blade, knife, box cutter, or razor, and then left in the freezing cold. Last week the Sparrow Fund made a grant to pay for the medical costs that Red Lake Rosie's Rescue has incurred in caring for Phoenix. It was the second time in the last year that the Fund has sent emergency funds to help that rescue for the victims of horrific abuse. But I'm happy to report that the story of the beneficiary of last year's grant, a pitbull type dog named Jacob, has a happy ending. Last winter, Red Lake Rosie's Rescue responded to a tip alerting them that a dog was curled up in a fetal position against a wall with blood spattered all around him. They rushed him to a vet, who determined that Jacob had been struck four times with a very sharp blade, knife, box cutter, or razor, and then left in the freezing cold, where he would surely have bled to death if the rescuers hadn't arrived. Jacob spent the next nine months recovering at Red Lake Rosie's Rescue, with medical care funded by the Sparrow Fund, as we waited anxiously to see if he could ever recover from the savage attack. 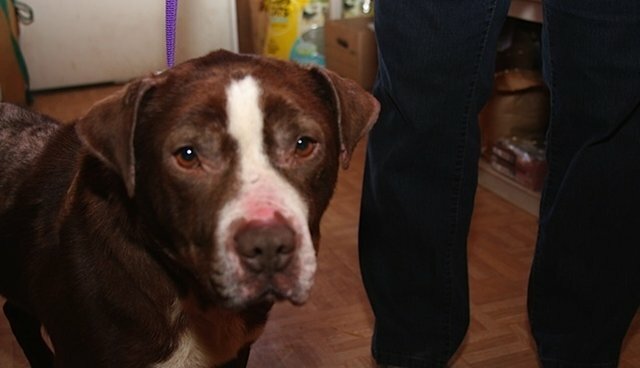 Jacob has now fully recovered and has even found a forever home. And some good news just crossed my desk: we have learned that Jacob has not only fully recovered, but has also found his forever home. It was love at first sight for Jacob's new companion, Chris, who says "he sleeps with me, goes for walks with me and brings great joy to our home." That's the power of the human-animal bond at work, and a perfect illustration of why the Sparrow Fund exists – to reaffirm that every life matters. P.S. We just responded to a request for help from Madison Ark rescue, which is caring for Delta, a blind American bulldog found beaten and dumped on the side of the road in Cleveland, Mississippi. Delta had surgery last week and is now recovering well. Madison Ark writes "This sweet girl has been wanting to run and play with the other dogs so badly so hopefully when her wound heals, she will be able to experience life as a cherished family pet that does not have to live life in excruciating pain." We hope so too. If you want to support the lifesaving work of the Sparrow Fund and read stories of just a few of the animals the Sparrow Fund has helped, please click here.